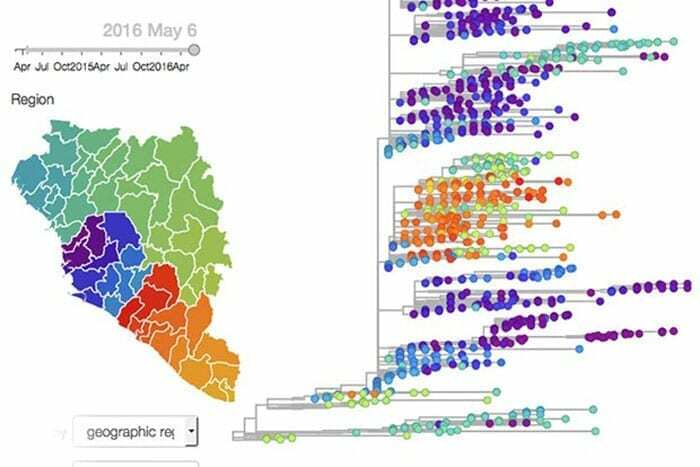 Fred Hutch virologist Dr. Trevor Bedford and Max Planck physicist and computational biologist Dr. Richard Neher designed a prototype called nextstrain to analyze and track genetic mutations during the Ebola and Zika outbreaks, but they envision it as adaptable for any virus. After three rounds of competition — one of which involved a public vote — the software tool has won the first-ever international Open Science Prize. Using the platform Bedford and Neher built, anyone can download the source code from the public-access code-sharing site GitHub, run genetic sequencing data for the outbreak they are following through the pipeline and build a web page showing a phylogenetic tree, or genetic history of the outbreak, in a few minutes, Bedford said. The prize competition was sponsored by the U.S. National Institutes of Health, the British-based charitable foundation Wellcome Trust and the U.S.-based Howard Hughes Medical Institute. The $230,000 prize money will go towards furthering this effort to adapt the system for additional pathogens.